Today marks the 108th observance of International Women’s Day. Today, we’re highlighting the work of the women drone pilots that we’ve met along the way since our launch of Solo and who have inspired us here at 3DR. 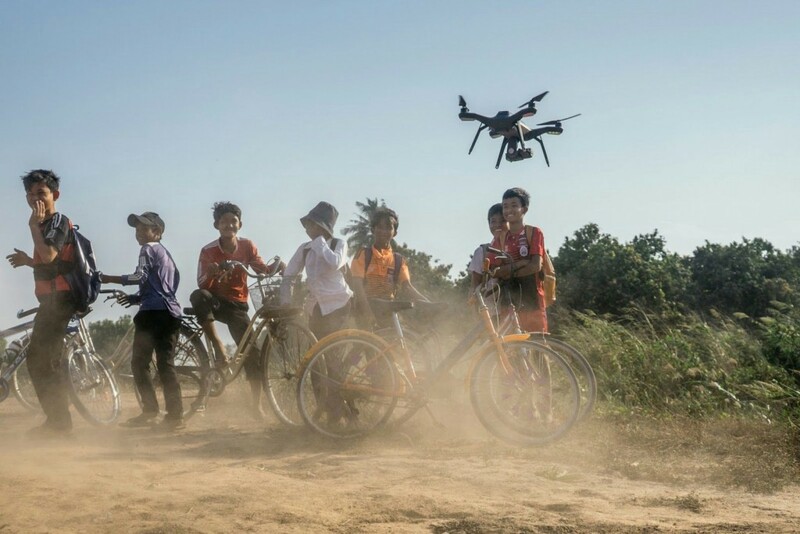 They are helping lead the charge for women from adventure sports to a new era of photojournalism, and are early adopters of drone tech. They are truly excited to use & share info about flying drones in each of their unique industries. With busy schedules, “Echo” Giesel Widmer, Jennifer Tan, Hannah Reyes, Kim & Makayla Wheeler, Marisa Jarae, and Amanda Cordell took time to chat with Aviator Program Manager, Kate Blaising, about their recent achievements. KB: Can a few of you tell me the most interesting thing you’ve had the chance to capture with drones? 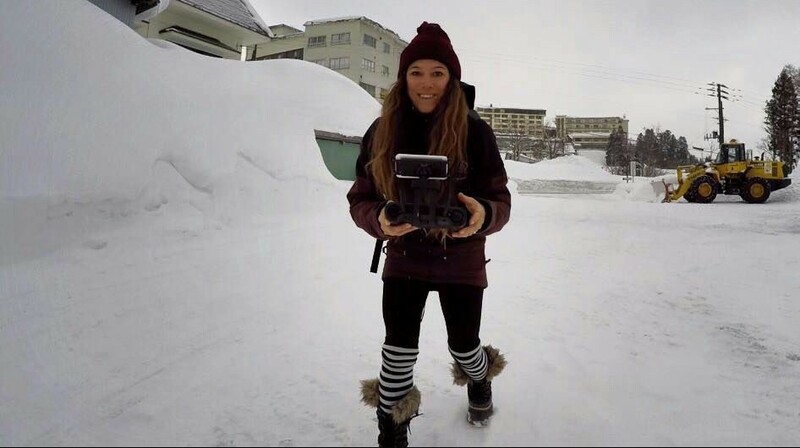 Echo: Living and snowboarding in Japan, I’ve had many opportunities to fly my drone in places I may not be able to otherwise; frozen rivers, lakes, and snowy mountains inaccessible by vehicle and boot pack. It’s a great way to find new terrain to ride and capture nature in its most raw form. Jennifer: Wasteland Weekend is in my top 3 for a ton of reasons. Thousands of attendees in leather and scraps, Mad Max vehicles everywhere, each so loud it would shake the ground underneath you, and an amazing crew helping me film car chases and stunts. 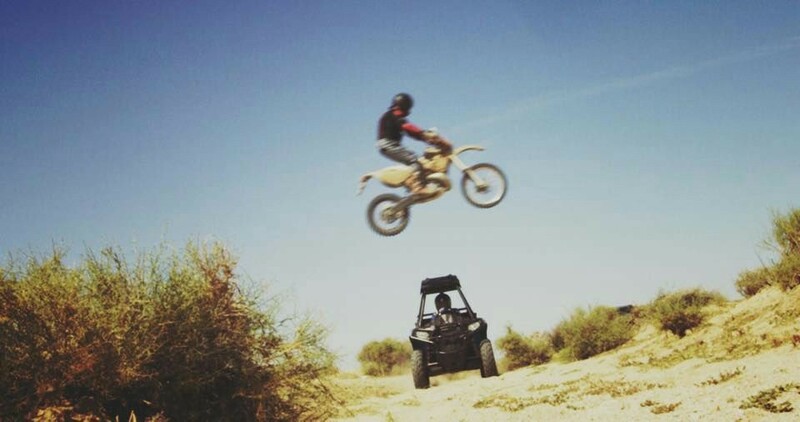 We even had Arnold Schwarzenegger’s “Arthur” double-jump over my Polaris on a dirt bike! Marisa: I love to capture the Rocky Mountain back country and foothills. Whether sunrise near the Million Dollar Highway, or most recently — some backcountry boarding and ridge line hiking, the aerial perspective really showcases the enormity and beauty of the hills in a way I’ve never been able to before. Amanda: I received my first drone just recently so I am a total newbie! I have big plans to use it to film mountain biking. We are still in winter mode in Utah so I am trying to get as much practice in as possible that way I am able to teach others and hand over the controls once I need to be the one in front of the lens. KB: What are your favorite features to use so far when you’re flying? Echo: The follow feature is my favorite. It gives me the ability to ride my favorite lines down the mountain with the drone on my tracks. Still a bit nervous about this one but testing is so much fun. Jennifer: My biggest tool feature wise, is probably HD video downlink. I literally couldn’t work without that. Pair that with instant playback, and I have the confidence to adjust, and successfully execute a shot every time. Marisa: For me, it’s a toss-up between the camera view on my phone/through the app or the home button. I love that I can see exactly what is being recorded, so if I need to change a few of the shots I was planning on, I can do so mid flight. And in the hills, landing can be tricky because space can be tight and level surfaces hard to find. Kim: FPV is, by far, the biggest feature Makayla and I rely on. Flying our first drone, with no FPV or gimbal, was a challenge to say the least, but it also made for becoming a better pilot. We knew that drone’s capability and the camera setting inside and out. Having to get up in the air within a 7-minute window, plan and execute the shots from the ground with no live feed took great skill. FPV takes out all the guess work. Smart shots are also an amazing feature, unique to Solo, that we are beginning to utilize more. It is also worth noting, that we rely on several other mobile apps for our pre-flight checks. Location constraints, weather conditions and the sunrise/sunset all determine our flight times. The most epic shots are always during the golden hour! Makayla: At first, I was a bit skeptical about Smart Shots, and I still enjoy flying manually for a lot of things; but sometimes it’s hard to fly with the precision that an Orbit or Follow shot brings. These smart shots are also very helpful in filmmaking, where there are many retakes and the shot has to be exactly the same every time. I also prefer to Shoot to Edit. I know what my post-production capabilities are and have the end result in mind before even taking off with the drone! Amanda: I am so impressed by how user-friendly it is overall! I was really intimidated to go out and fly it for the first time since I have zero experience in flying drones, but it really blew me away with how easy it is to teach yourself to use it. In filming mountain biking, we typically do a bunch of takes of the same clip, so I am really excited to get out and use the Cable cam feature, where you can plot a course to fly/film over and over. Artist Christina Angelina, @starfightera, showing off her drone piloting & art skills with @kungfubreakfast. KB: You’re all women of many tricks and trades, what are some of your favorites and how did you get into them? Echo: Well skydiving and snowboarding are the top two. I got into skydiving about four years ago after a rock climbing expedition in Thailand. I saw a man jump from the fifth pitch of my favorite route and I was starry eyed. I had to know how I could do that. And he taught me about base jumping and said the first step was 150 skydives. 274 skydives later here I am. Snowboarding, well that’s been a love affair for the past 17 years. As a teenager, I fell in love with skiing which turned to snowboarding. As an adult, now I spend my year chasing the powder. Hence Japan and JaPoWWWW. Jennifer: One of my favorite trades is costume and fashion design. I’ve been obsessed with courier clothing design since I was 7 and got my first sewing machine. Nowadays I am either doing molecular gastronomy, or racing my motorcycle or Polaris through the desert. I pick 5 goals a year to conquer, and I refuse to say “I can’t do that” to anything. This year, I want to jump out of a plane a minimum of 6 times, base jump the stratosphere, win a race on a dirt bike, win a side-by-side race, go grocery shopping decked out as Captain Phasma, and ride America’s tallest rollercoaster. Marisa: When I moved to CO with my husband three years ago, I immediately got involved with the Colorado Mountain Club to learn all of the skills I’d need to be safe and savvy. 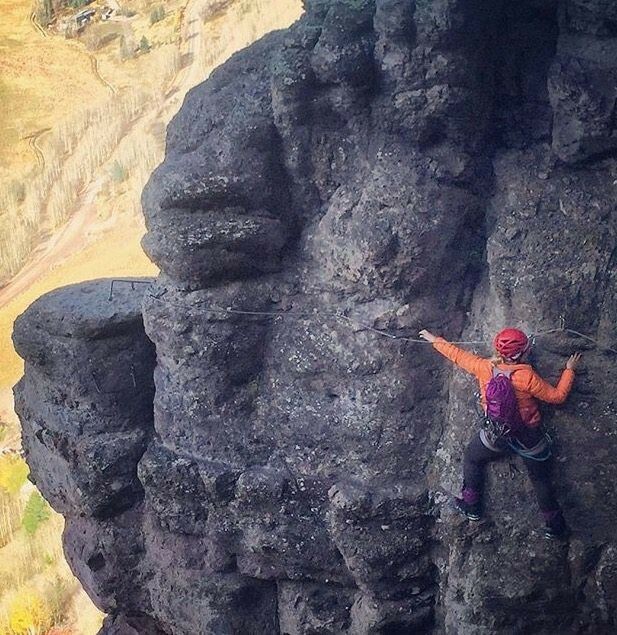 Through the club, and networking of my own, I now climb rock (lead sport — trad is coming this year though! ), ice (I dabble on ice on TR only) and snow, backpack and iSUP. I have a basic knowledge of wilderness first aid (getting full WFA in 2016), can navigate with a map and compass, and am AIARE 1 certified. This year I also learned how to travel with a glacier team, how to perform basic crevasse rescue and began dabbling in backcountry snowboarding. KB: What is something that used to hold each of you back as athletes & artists? And, how you are using your experience to overcome new, unexpected challenges? Echo: I think as an athlete I’ve always put 110 percent into what I’m trying to achieve. I wouldn’t say anything has held me back unless it’s been my own doubt. But the more experienced I’ve become, the more I feel like the opportunities are endless and I’m just beginning. With 3DR, I’m able to have sight into places I’d have to scout for weeks before for snowboarding, for climbing and for hiking. It’s become a powerful and useful tool for me. I’m excited to have it help me push my limits. Jennifer: Money and support. It’s funny, I’d I get support to do something, I usually have to save for a year to do it. But if I have the money to do one of my crazy adventures, I usually get the “you’re nuts! You’re going to die doing that. Find something else to do…” response. The biggest challenge I’ve ever had as an artist or pilot, are my own technological limitations. It’s only lately that technology in the drone industry is allowing me to do the things I want, without modding my drone, and ruining the warranty. And of course there is the fact that I’m a woman, lol. Men seem to get a little edgy when they see a woman flying or filming, but in the end they adjust and the day usually goes great. Amanda: I’m with Echo, it’s the fear factor, for sure! Every track is different and delivers new challenges for each rider. It is sometimes very difficult to get out of your brain and trust your skills enough to give up control and be able to go out and perform at your best. I’ve found that music helps this some, providing a way to escape from your self-limiting thoughts and relax some in stressful situations. Marisa: This winter has been far more humid than my previous winters here. This season, my biggest challenge has been having the correct gear to keep warm and dry. Colorado is usually so dry that boots, socks, and under layers all dry pretty quickly. I actually got a touch of frostbite earlier this season because the winter gear I used last season just wasn’t cutting it… that was fun. I’d also say that learning to use a map and compass was a challenge for me at first. But I have to say — once I learned to use it — and successfully navigated — blindly and through a dense forest with a lot of down trees — very few things feel as good as that accomplishment. Plus — the freedom of being able to know where you are and where you’re going is pretty rad! KB: What makes you feel powerful, and what opportunities have opened up from that awareness? Echo: I think I feel powerful when I’m open to the world around me and open to all opportunities. There is no specific route for my life, I kind of flow in and out of places very fluidly. It’s allowed me to experience amazing places, cultures and people. It gives me an especially powerful tool of connection. I feel like I have small families all over the world. And that feels pretty powerful. Jennifer: I’ve had a pretty rough life so far, so instead of moping around playing poor me, I’ve flipped those experiences. I use my confidence and strong personality to defend the drone industry, get coffee, and fly difficult shots! Kim: As a drone team with Makayla, we are sometimes able to negotiate with authorities in a unique manner to accomplish our mission. A recent example of this is a carnival event at our local mall. We just couldn’t resist flying the drone around the ferris wheel at sunset! So, we identified three potential parties of concern: local police (on event duty), property owner (the mall) and event manager (the carnival). The local police have always been supportive of us flying. However, liability prohibited the mall from allowing us to take off/land from the parking lot. Since the cop was sympathetic to our cause, he suggested we take off/land from across the street so we could capture the epic shot we so desired, which we did! The carnival had no concerns since we flew the perimeter of the event. Almost every time we fly, people of all ages will come up and want to know more about the drones, which we use as an opportunity to educate about responsible and beneficial drone use. We are continually amazed at the amount of misinformation out there! Marisa: I was raised in Florida, but spent a decent amount of summer breaks in the Front Range hiking some of the more popular 14ers with my parents. I did a three week backcountry course with Outward Bound in the San Juans when I was 18, and while that trip was the very definition of a love-hate relationship, it solidified for me that my place was in the hills. After that trip, I knew I wanted to do bigger mountains, harder climbs, longer trips. Backpacking just came as part of the territory — necessary for getting where I wanted to go and doing what I wanted to do. I have so many goals, I can’t keep track — but one of the biggest ones is to climb my first glaciated peak. My team and I are going to apply for a Rainier permit. I have big photography goals as well — I tend to focus on women in the outdoors and in the outdoor industry. I’m hoping to do more with that this year. KB: A few of you already had backgrounds in production and drones before flying Solo. Do you feel like it’s been easier for you to adapt in the field? Jennifer: Absolutely. I’m an extremely creative, and artistic person, so not only do I adapt very quickly to utility of drones in a vast array of situations, I’m always trying to come up with more practical uses on my own. Makayla: My interest in aerial photography developed out of a need for epic aerial cinematography in my short films and nature documentaries. The most won a Filmmaker Award at the local film festival. I’ve been flying drones over the past 3 years to shoot primarily HD video for personal and recreational use. Kim: I began as a spotter and maintenance technician assisting Makayla, but have gradually learned to fly too. Before flying Solo, our missions were either just photo or just video; now we are able to switch back and forth in flight. Recently, we’ve been flying simultaneously, so I’ve picked up the photography side & Makayla continues to shoot mostly cinematography. One of our motto’s is, “If a picture speaks a thousand words, than a video speaks a thousand pages.” Anyone can snap a photo or shoot a video, but not every photo and video tells a story. KB: You’re all in different types of fields. What do you use drones for? How do you see them being used in the future? Echo: I use drones to see the world from a different perspective. To see the world as it is, vast. When flying high above a place that seems to familiar to you, you discover nooks and crannies that slipped your sight before, places within places very familiar that are strangely different and new. I see them being very prevalent in the future. Not only in film-making, but also in city planning, expedition routing, sports coverage and much more. Hannah: I always say that my camera was the first tool I had to explore, and so I’ve always used it to ask questions. Many of the topics I cover focus on individuals mired in complex situations created by things such as poverty or inequality. I grew up in Manila, and those stories were constantly around me. Having a camera let me come closer to it. I document my own travels, my own personal stories — to me it’s not just work but it is also a huge part of how I live. I look forward to seeing more people exploring using drones. I am really excited as well to find out what I can personally explore with it too. Jennifer: My drones are used a majority of the time in t.v. and movies; everything from feature films, documentaries, reality shows, horror, commercials and even some adult drone themed entertainment. Kim: We live in a time where technology is revolutionary and what would have cost thousands of dollars on a big film set and years of training can be created with ease by the amateur with a desire to learn. Quadcopter aerial imagery has become especially popular because it fills the gap between ground-based and full-size helicopter/plane shots. It can maneuver at any angle or close-range altitude, resulting in an HD, electronically stabilized video package or set of stills from a stunning and rare perspective. We continue to fly our drones for personal use, primarily for short nature documentaries throughout Florida. One of our favorite places to fly is over the many unique fresh water springs. Makayla: I created a 12-minute video documentary a few years ago and plan to follow it up with a possible sequel where a lot of aerial shots will be incorporated. I’m also currently working with the Nature Conservancy on a project that will feature the beautiful Blowing Rocks Preserve in Jupiter, FL. In the future, I’d like to take my aerial/ground/underwater imaging capabilities to travel the world and produce nature/travel style documentaries. Marisa: Mostly, I’m using my Solo to capture people out in nature, and capture the grandness of nature itself. I could see them having a safety use, however — in terms of using satellites to locate people, scope avy terrain, etc… OR for capturing content, having multiple drones function as different camera men, all controlled with one remote — like a flying studio. Amanda: I will be using my drone to capture the thrill that I get from doing what I love. 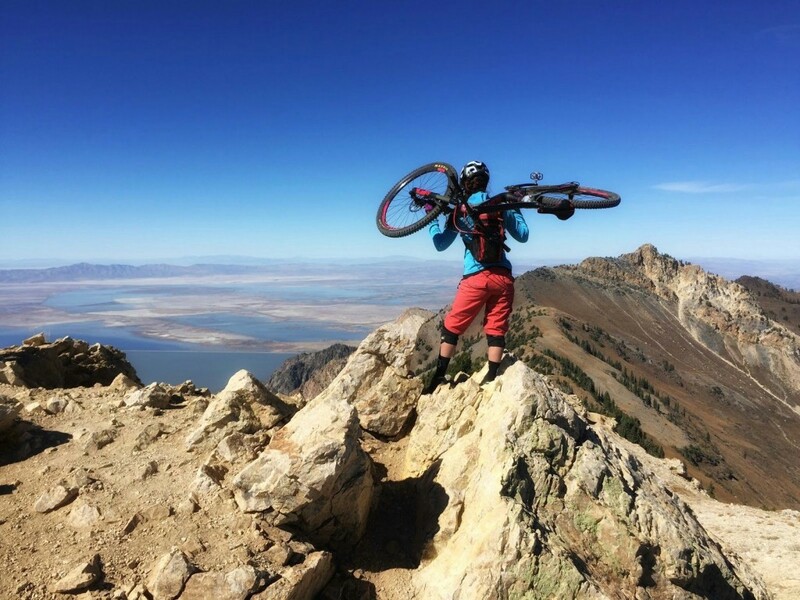 That just happens to be mountain biking, but I think that drones are an amazing tool for putting viewers in our shoes and sharing what drives us in our sport, no matter what it is! 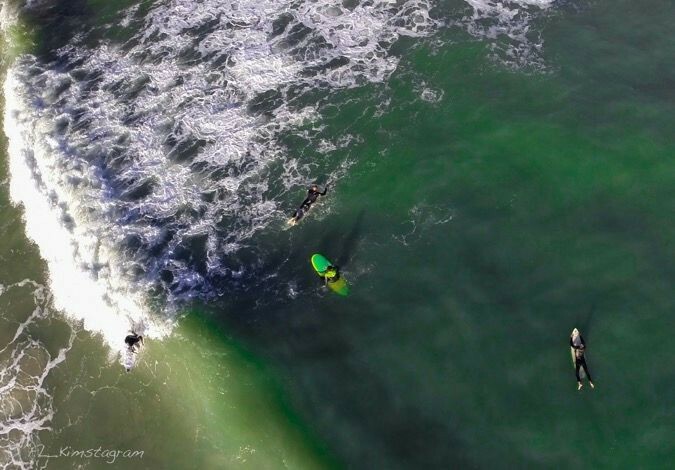 There is no better way of sharing something that you are passionate about than with beautiful imagery, and drones are just another tool to help in that quest. KB: What are you sources of inspiration for drone photography? Echo: My inspiration for my drone is just my imagination. I find places that I’m curious about seeing from a different perspective, or places closed of to the walker by. So I push forward to explore, and find out a bit more about what it is that’s hidden from sight. And usually I’m pleasantly surprised with what I find. Jennifer: I have the nerdiest answer ever. Star Wars. I love watching the pilots fly, the camera angles give so many new ideas for shots I can do on my own. Hannah: I like browsing through photography books… I also keep myself occupied with reading. I talk to people a lot. I try to share stories as often as I can whether from the ground or from up above, and I always learn something new! Kim: Makayla is the inspiration behind our interest in drones. As a young, filmmaker, she started her own production company at 15. One of her projects, a Public Service Announcement, won a national video contest. It was the timing that afforded us opportunities that we don’t have now. We got into flying these types of drones before the popularity explosion of 2014–2015. Makayla has been a fabulous drone instructor. The interesting thing about flying a drone is that it can be so technical and so creative at the same time. There is planning and preparation of gear that goes into every flight and then there is extreme creativity that must happen in order to get an epic shot in the air. I bring the technical side that incorporates planning and maintenance while Makayla feels at home getting a new shot. Marisa: Honestly — it’s mostly seeing the mountains. And setting plans to reach my goals. I’m also fortunate to have friends that have great ideas as well and invite me along. I think about the hills all the time. And photography — I think about that a lot too. Combine the two, and there are very few weekends that I’m not in the mountains. KB: What tip would you give to someone just starting out with aerials? Echo: Fly slowly, breathe, do not be afraid to go “too” far, use your smart shots, hold steady, imagine, create and smile. Jennifer: Learn your equipment. Learn the rules. The FAA is getting more and more involved in the drone industry these days. With that, the only protection we have, is education of the laws that exist, don’t exist, and city and state regulations. There are dozens of techniques you can use to capture amazing footage. Most of which take practice, and then more practice, a few rage quits, and then more practice. But it’s so worth it! Makes no difference being the most talented pilot in the country, if you are never hired because you didn’t learn everything on a legal side. Kim & Makayla: Our advice to anyone wishing to establish themselves as drone pilots is to let your skills, flight record and portfolio speak for itself. When people see you can fly responsibly, competently and accomplish your flight mission successfully, you will earn their respect over time. Let your photography and cinematography do the talking for you. Whether that be flying creatively or for a particular industry, seek excellence in all aspects: from pre-flight to post-flight. Planning is essential. Keep your drone equipment up-to-date and maintained properly. Don’t take unnecessary risks; know the regulations where you fly. In this quick evolving industry the lines are still very blurred in many aspects. Each flight must be carefully evaluated in the context of benefit and risk. Lastly, be a perpetual learner, always refining your skills. We are constantly out shooting on the ground and even underwater to refine our photography and cinematography skills, which then apply to aerials. Also, we would highly recommend collaborating with others on projects. Not only is this fun, but it brings a mix of the best skills sets to create better results than could ever be achieved on your own. Marisa: Just like photography — try to plan your shots. Think through the eye of the lens. And practice landing. Amanda: Don’t be afraid! The technology has come so far in such a short time! It seems like just yesterday that we started hearing about drones and now anyone can buy one and easily put together beautiful footage of anything from scenic views to action sports! We’re excited to announce that 3DR has recently raised $53 million in capital as part of our Series D funding round.